In place of the spring is a Rigid adapter. The laser cuts in the Rigid adapter cylinder allow the post to bend at a pivot point. The Rigid adapter is designed to take several hits. Once struck, the post can be easily pulled back to its upright position. 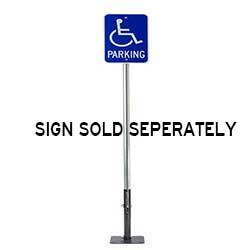 Among parking posts this surface-mount rigid flexible sign post is one of the best available. Not only does it feature high-quality material and innovative design but it also solves a very expensive issue endemic to parking lots and structures everywhere. This rigid flexible sign post is highly functional too. Not only can it handle any steel regulatory sign such as parking lot signs or other traffic signs, but it only takes minutes to install without any special tools required. Lastly, the flexible parking post featured here can be easily applied to a variety of surfaces including concrete, asphalt and natural ground. See below for installation instructions.